24 Kitchen Christmas Decor Ideas That Are All About Festive Ho-ho-ho! Home » CHRISTMAS DECORATIONS » 24 Kitchen Christmas Decor Ideas That Are All About Festive Ho-ho-ho! Amidst getting that ornament loaded Xmas tree and festive gifts ready, we must not forget the spot of the house where the heart resides – the kitchen! After all, those yummy treats for Christmas and the special dinner are all going to be prepared here, which in turn calls for a theme-perfect decor too. To get that done, grab your dose of inspiration from these amazing kitchen Christmas decor ideas listed below. Adding a little Christmas touches to your kitchen can make it perfect for the festive season like putting together these tiny pieces that spread the vibe around the setting. A gorgeous wreath loaded with pinecones hung on a cabinet and the shelves bordered with a stunning garland are the minimal things that are perfect for the kitchen decor. Filled with the bright Christmas colors, this beautiful setting flaunts the vibrance of the red, green and golden tones. The gingerbread wreath, the galvanized vase with florals and the garland with ornaments work up perfectly as the focal point. If you have a little shelf in your kitchen then this stunning decor is your thing as it makes the best use of the cabinet. A lush wreath makes the backdrop while the little pieces like the trees, pinecones and the block letters complete the look. For a minimal lover, this arrangement is your thing as the simplicity makes it even more elegant and classy. The JOY plates in the middle also work as the backdrop and the main focal point in the decor flaunting the beauty. This easy to do decor is equally fun to do. All you have to do is grab all the Christmas ornaments and fill your crockery with them placing them anywhere you like in the area. The vivid ornaments bring a lot of beauty to the look. Christmas painted mason jars, embellishments and some ornaments placed along with the regular stuff of the kitchen brings a vibrance to the area while the lush wreaths work their magic. For someone who loves a lot of pop of color in the arrangement then this setting here is the right choice as the main element of its beauty are the bright tones that compliment each other and the pieces that bring the perfect festive look. The combination of green and white together compliments the space while the antique crockery also brings the rustic appeal to the look. The embellishments and fruits bring a little pop of color. This stunning setting is all about the beautiful festival of Christmas, right from the hanging sleigh loaded with gifts in between to the gingerbread house and the cookies on the island, everything displays the look. The gorgeous blend of winters and Christmas is beautifully reflected in this setting by the little elements like the frosted trees placed on the table, the cups with reindeers and the little polar bear adds to it even more. Perfect for the Christmas brunch decoration, this table arrangement is just so easy to put together. All you have to do is grab mason jars and fill them with berries and greeneries, put candle in between and adorn the setting with them while the centerpiece filled with fruits and greeneries also makes a statement. Flaunting the beautiful festive appeal, this setting is loaded with Santa statues, ornaments, wreaths, some super cute bites and the candy striped ribbon laid down. This decor will surely be the showstopper in your house. The metal galvanized pieces placed in the setting bring a frosty appeal to the decor and make it super chic. The red decorated cups and white ornaments in the basket bring the pop of color while the red and white accessories compliment the look. A kitchen island is the hub of the kitchen and also the most attention drawing so spruce it up with this wonderful arrangement that is so easy to put together. The rustic tray centerpiece filled with tiny pieces look adorable while the red and green printed cups make a statement. Start with your repurposing skills and grab an old vintage looking wooden box and transform it to a decorative piece that houses versatile mason jars filled with candy canes and marshmallows and the white cups complete the look with greenery and cinnamon sticks. Centerpieces become the focal point in the table arrangement and draw a lot of attention. Just like this stunning piece here that houses bundles of decor and looks like a mini christmas tree adorning the table. Flaunting the farmhouse appeal, this little setting here looks absolutely versatile as different items are placed that compliment one another gorgeously while the tiny chef santa looks extremely cute. Kitchen islands are a major section of the space and they compliment the entire area with their look. So while decorating for Christmas flaunt the island space with a giant sleigh topped with vivid cyprus trees and gorgeous snowflake stands. Decorating a shelf is an easy task as the pins provide bundles of options to adorn the space like hanging kitchen cloths with the Christmas colors, baking gloves, large cups and mason jars and also the super pretty wreath here. A unique centerpiece brings an all new vibe to the setting just like these galvanized metal pots that resemble antique goblets bringing a vintage appeal. The greeneries and red berries flaunt the pop of color along with the cute ribbon. Hot cocoa is what everyone loves during the chilly winter months, this super cute hot cocoa bar is adorned with the Christmas appeal. The cocoa tray is decorated with pinecones, candy canes and the tiny tree. The sign adds a lot of beauty to the bar space. Making the stunning backdrop for the nook, the chalkboard adorning the Christmas vibe is the main feature in the setting. The tree in lantern and the one in the metal pot bring the much needed vintage and cozy look. 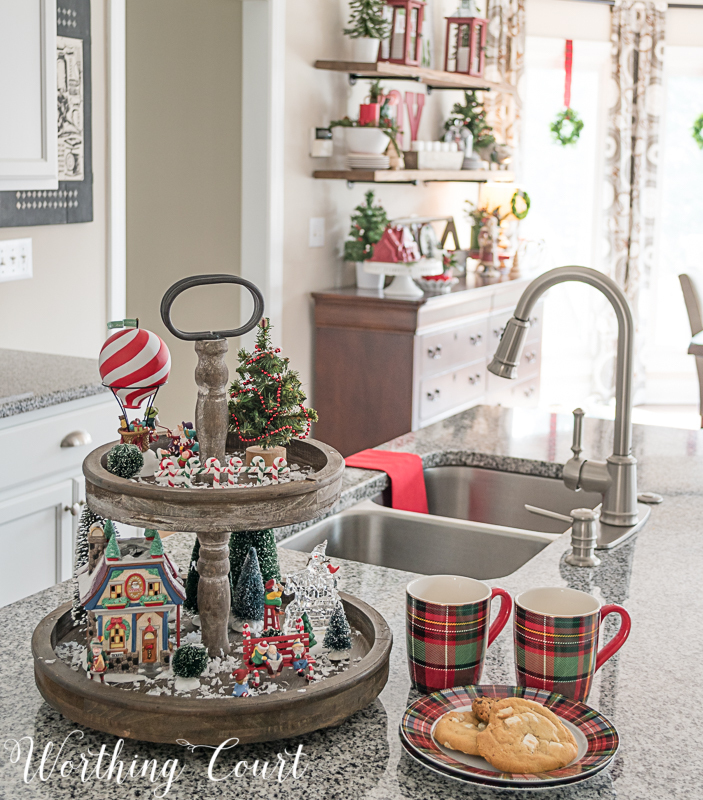 The whole Christmas vibe oozing from the above decorations ranging from lush-looking islands to ornaments sparkling all around makes these kitchen Christmas decor ideas something to look out for!